If you are wondering just how the Swivel Store would work for you, here are some facts to help you decide. No installation is required. Each unit holds 20 bottles and takes up less than four inches of shelf space – about the same as a box of Fruit Loops. All standard size containers and bottles easily fit inside, and your only problem will be deciding how to fill all that extra space that your spices used to require in your cabinet. The unique Swivel Store holds ten spices on one side and ten spices on the other - right where you can see them best. This cleverly designed organizer glides forward, and then swivels like a revolving door, presenting each of the spices within easy reach. Don’t worry about installation, because there’s not any with the Swivel Store. Just place it on a shelf and fill it up with all your precious spices and flavorings. You know that some of them are far from cheap, and you wouldn’t be the first person who accidentally purchased a flavoring twice because the small container was hidden in a cluttered cabinet. Even worse is when expensive spices go out of date because you couldn’t find them when you needed them. And best of all, you will never again be forced to use Allspice, when your recipe called for nutmeg. Even though Swivel Store is a perfect kitchen accessory, it’s also a handy clutter-buster in the garage or workshop, holding small bottles and containers of nails, screws, glue, paint, etc. Most of us could use a Swivel Store in the bathroom too, where it’s vital to keep our medications and pill bottles organized and within easy reach. Your mind may be racing ahead to your craft area or office, where hundreds of small containers would be so much easier to use if they were only organized. 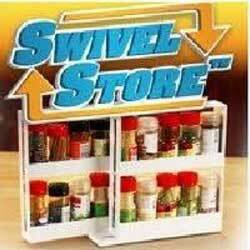 Swivel Store is the only organizer that slides, swivels and keeps everything you need right at your fingertips. Today, when you order the Swivel Store Organizer for just $19.99 plus postage and handling, you will also receive a second entire unit just for paying the postage and handling of $7.99. Bought in local store. Works very well but not for larger sized spice bottles. I would reccomend this. Really helps with clutter!